After gobbling up Goddess Interrupted at just the right time, I was super lucky that The Goddess Inheritance was published just a few days later. But, my, those were some long days. I had gotten Goddess Interrupted as an ebook though my local library but there was no way I could wait for it to get the third book. I had to do something I almost never do--buy the book myself. I was in such a rush I bought the ebook so I could have it immediately. When we last left Kate she and Ava (Aphrodite) had just left the Underworld to search for Rhea and convince her to join the fight against her husband Cronus. Unfortunately for Kate, Calliope (Hera) and Cronus had captured Nicholas (Hephaestus), Ava's husband, and forced Ava into turning Kate over to Calliope. Calliope, the Goddess of Marriage and Fertility, had ensured that Kate and Henry's last night together was productive and gleefully tells the shocked Kate that she is going to take away everything that Kate loves, her husband, her mother, and her unborn child. In The Goddess Inheritance, Kate is held captive throughout her pregnancy with no way to contact Henry and no hope of escape. Ava tends to her but she is a victim of Calliope's as well and is powerless while Nicholas is held captive. When Kate's baby is born she must figure out a way to save him, herself, Henry, and the other Olympians from the vengeful Cronus and the demented Calliope. This was such a page-turner, er, swiper. Although Kate makes some dumb decisions, it's not out of character for her. She's young, she's just watched her mom die and come back as a Goddess, she's died and learned that she too is immortal, she's suffered through a pregnancy without her husband by her side, she's given birth and watched her baby get snatched by the evil twisted Calliope. Logical thinking is not going to be her strong suit. I enjoyed this book immensely. I *had* to find out what happened. 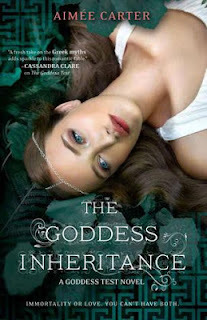 The Goddess Inheritance is a satisfying conclusion to an entertaining series.